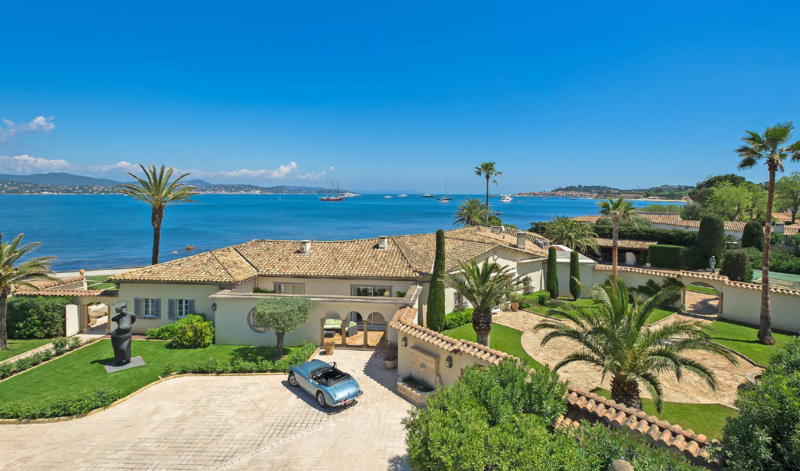 The charming Provencal villa is situated in the pretty village of Ramatuelle, near St Tropez. The property is within a closed private domain, just minutes away from the Pampelonne Beach and the famous Club 55. The beautiful landscaped garden features olive trees over 100 years old, a rose garden and jasmine trees as well as a panoramic view over the beach and the sea. The main villa is spacious and bright with tasteful decor and high quality furnishings that emphasise the understated grandeur of the property. Guests are welcomed into the property via a large entrance hall, opening into the wonderful living room. Floor to ceiling windows allow natural light to flood the space and bring the incredible views in. The living room features a flat screen television, an authentic fireplace and access to the stunning terraced area. The dining area is equally large and accompanies the fully equipped kitchen with arched windows bearing views of the garden. Guests will find 5 of the bedrooms situated on the ground floor. Each bedroom is tastefully decorated with sumptuous beds and warm decor as well as an en-suite bath or shower room. Another double bedroom is located on the top floor. A tropezienne terrace is located on the rooftop where guests can appreciate the spectacular views. The sensational 15 metre swimming pool includes its own pool house with a Jacuzzi. There’s an additional caretakers’ apartment for staff.